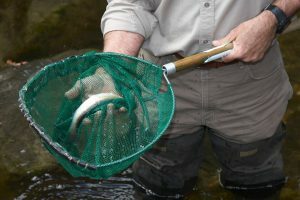 CT DEEP fisheries scientist Steve Gephard nets a migrating river herring at the dedication of the new Bride Brook culvert. Copyright Robert Lorenz. The Sound’s wildlife habitats and fisheries have long been threatened. Through your support and sustained hands-on action, we will bring them back. Humans have severely impacted fragile wildlife habitats throughout the Long Island Sound region, both in the water and on the shore. Repairing the damage is vitally important not only for the health of the ecosystem, but to maintain this region’s maritime heritage and way of life. Save the Sound’s Green Projects team works with volunteers, public and private community organizations, engineers and landowners to halt the decline and revitalize what’s been lost. It’s a tapestry of dozens of local projects large and small, replanting marshes, dunes and riverbanks, and reopening rivers to the migratory fish that have traveled them for millennia. Learn more about the philosophy and practice of habitat restoration. See how people like you are helping in the Restoration Project Gallery. Dams have been part of the Long Island Sound watershed for hundreds of years. Hundreds have outlived their usefulness. Originally built to help humans… now, they damage fish and migratory wildlife habitat. And, too many ancient dams are at risk of failure. Removing defunct dams provides significant ecological benefits, resurrecting migration routes for alewife, blueback herring, eels, and others. In addition, taking down dangerous dams reduces flood potential by eliminating the risk of catastrophic failure. No other organization brings our blend of direct engineering and construction management experience, combined with advocacy and a hardworking volunteer network, to the task. Save the Sound has proven ability working hand-in-glove with engineering firms, contractors, landowners, and local governments to complete these projects safely, efficiently and economically. Get the details on dam removal in the Sound region. See featured projects that are opening rivers to migratory fish. For decades, Long Island Sound’s marine life has struggled to survive, fighting habitat loss, pollution, and overfishing. Once there were millions of river herring and menhaden. Now, we’re down to a few hundred thousand migrating in Long Island Sound rivers. Their decline has shorted a food source for iconic species like bluefish and striped bass, as well as osprey and even whales. It’s unsustainable. We’re engaged in an ambitious, multi-pronged effort to rebuild fish stocks and habitat, so the entire Sound marine ecosystem can thrive once more. Tactics include direct and grassroots lobbying to protect against overfishing, engaging fishers and shoreline residents like you, restoring essential wildlife habitat, and vigilantly monitoring the state of Long Island Sound waters. See how we’re returning abundant fisheries to the Sound. Meet the Soundkeeper who speaks up for fish and fishermen.